The Morehead Planetarium and Science Center is bringing two TV stars who specialize in science entertainment — Adam Savage and Jamie Hyneman, hosts of the Discovery Channel television show “MythBusters” — to the University of North Carolina at Chapel Hill as part of the North Carolina Science Festival in Septmeber. Check out the official press release for more information about the show and how you can get tickets. “An Afternoon with Adam and Jamie” will begin at 2 p.m. Sept. 19 in UNC’s Dean E. Smith Center. The event is part of the North Carolina Science Festival, Sept. 11-26, the first-ever statewide science festival in the United States. UNC’s Morehead Planetarium and Science Center coordinates the festival, with participation by museums, parks, community sites and other facilities throughout the state. 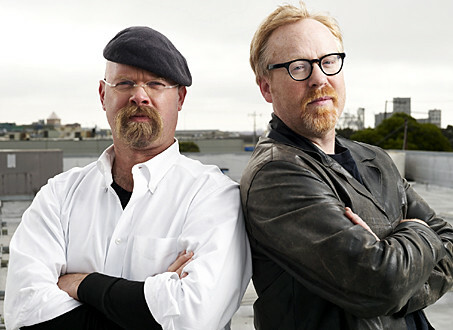 During the 90-minute program, Savage and Hyneman will share stories from behind the scenes of their popular show. They will also feature special video presentations of spectacular explosions and other “for fans only” outtakes. The program includes a question-and-answer session led by Chancellor Holden Thorp, with opportunities for questions from the audience. Tickets go on sale July 26, through www.tarheelblue.com. Lower-level seats are $28 per person, and upper-level seats are $18 per person. A limited number of premium tickets are available at $100 per person. Each premium ticket includes a meet-and-greet reception before the event with an opportunity to have a photo taken with Savage and Hyneman, reserved seating in front of the stage and a North Carolina Science Festival T-shirt. In each episode of their TV show, Savage, Hyneman and their team of investigators apply scientific method to commonly held beliefs, testing myths with lava lamps, rockets, sharks, port-a-potties and other items not found in the typical science lab. Their experiments have included converting a vacuum cleaner into a jet engine, swinging 360 degrees around a swingset and floating on a raft filled with helium.